We’d love your help. 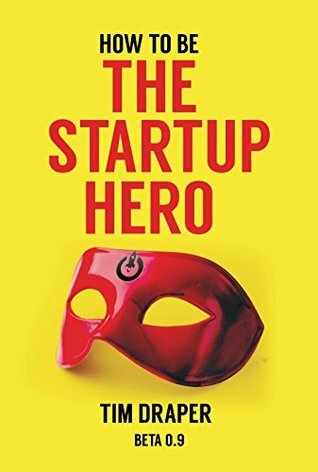 Let us know what’s wrong with this preview of How to be The Startup Hero by Tim Draper. I hope that this book will inspire you to act. To make that move. To fulfill your vision. I want to take you closer to your goal, whether that be starting a billion-dollar unicorn, building a revolution, or just helping you better understand that change of any kind starts with you. You can be the Startup Hero. Startup Heroes are the ones that drive progress, and whether yo I hope that this book will inspire you to act. To make that move. To fulfill your vision. I want to take you closer to your goal, whether that be starting a billion-dollar unicorn, building a revolution, or just helping you better understand that change of any kind starts with you. You can be the Startup Hero. Startup Heroes are the ones that drive progress, and whether you bring us to another planet or make your neighborhood a nicer, happier place, you can become a Startup Hero. This book is the first step. It helps you take that first step. The step will be different for everyone. It might be to call that customer. It might be to draw up a design concept. It might be to talk to your boss. With this book, I hope to guide people to think big, drive change and go full speed ahead. I am giving them a pledge to do their work for good, and I am giving them some of the tools they need to accomplish their goals. This book is hard. It takes you through a variety of activities, questions, stories and challenges (even puzzles and poems) working both the right and left side of your brain and all the parts in between. The activities I propose are challenging and sometimes even embarrassing. The questions I ask are probing and provoking. The stories I tell are used as examples to guide you toward what I call Startup Heroism. So, why would you read this book? Well, I have worked for 30 years for entrepreneurs. I have supported, funded and coached Startup Heroes all my working life. And I have tested the concepts of this book on the students at Draper University and they have come out to be some of the most interesting, dynamic, and motivated people the world has ever seen. In fact, we have had about 1000 students from over 60 different countries come through the program at this writing, and they have started more than 300 companies! I wrote this book so that some of the thinking that I applied to Draper University could be spread wider, in hopes that these messages would reach other potential Startup Heroes (maybe you) who might make an impact on the world, be proactive about their work, or at the very least, improve their lives. So, I implore you. Read this book, try this book, do this book, play this book, absorb this book, experience this book. It might surprise you. It might thrill you. It might drive you. It might kill you. At the very least, I hope it will give you a perspective on how real progress is made, and at the very best, it might just change your life. To ask other readers questions about How to be The Startup Hero, please sign up. As it stands, the books isn't just a guide and a textbook, it is also (trying to be) memoir, War of Art, Seth Godin, collection of quotes and probably a bit more. Probably more suitable for airport paperback use; grab it, jump around, skim a bit, read a bit, underline some stuff, pick it up a month later and read some more. While the book itself is not the best read you will have this year, the ideas found inside are simply priceless. This is one of those books that instantly make you want to go out and change the world. An ego trip. That’s pretty much it.